The fifth and final compact disk in the series echoes the structural principle of the first CD: there are compositions, representing various periods of Ciurlionis' works grouped together, and each of these groups are separated by a fugue. The return to the original organizational principle was implemented to recognize the contribution of Nikolaus Lahusen and represents an attempt to unify the whole five-CD cycle. Therefore the fugues on this CD, separate here five canons and a set of variations in D major, composed in Warsaw between 1897-1898, miniatures composed in Leipzig in 1902, miniatures composed in Druskininkai and Warsaw in 1906-1907, and the late preludes and other pieces composed in Druskininkai in 1909. The variation cycle in D major is the earliest known large-scale composition by the composer, published almost one hundred years after its completion and first performed and recorded by pianist Rokas Zubovas in 2005. Among the early Canons, one is inverted (C minor), another is augmented (F Sharp Minor), and yet another is a double counterpoint (E Major), exhibiting creative voice leading and rapid progress of the young student-composer. Recorded next to them are three character miniatures, Prelude (VL 108), Little March (VL 168), and Mazurka (VL 198), also dating from Ciurlionis' study years. Preludes composed in Druskininkai and Warsaw between 1905 and 1907 exhibit all the essential features of the mature style of the composer. The majority could be called basso ostinato preludes. Their compositional outline is a result of perpetual repetition of a series of intervals, pitches, or rhythmic patterns. Some of the preludes are based on diminished or augmented modes, and in many of them the composer refrains from using key signatures. Compositions from the summer of 1909, the last summer Ciurlionis spent in Druskininkai, clearly show a turn to modernism. In them, next to complex musical language, one can also hear fragments of Lithuanian folk songs-the composer turned back to the eternal inspiration source, folk music. For example, an atonal fugato on a folk tune appear in the middle section of the Prelude in C minor (VL 341), while in I've Sown Rue (VL 334) the folk song is harmonized bi-tonally. 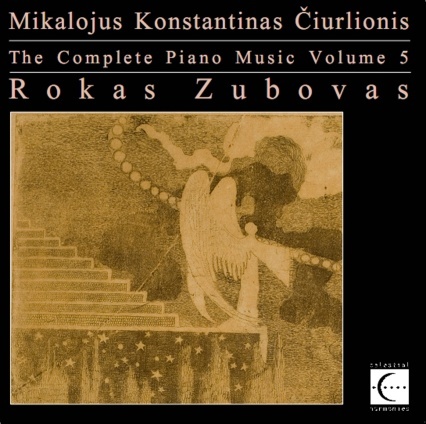 Recorded in Bremen, as a co-production between Celestial Harmonies and Radio Bremen, this is volume five of the first ever recording of the complete piano music of Mikalojus Konstantinas Ciurlionis. 1 Prelude in D minor Op. 19 No. 1 VL 266 1'29"
2 Basso ostinato Op. 19 No. 2 VL 267 1'33"
3 Nightingale Op. 19 No. 3 VL 268 1'03"
4 Theme and Variations in D major VL 151 15'33"
5 Canon in D minor Op. 9 No. 3 VL 127 2'16"
6 Canon in D minor VL 118 1'49"
7 Canon in F sharp minor VL 147 1'21"
8 Canon in F minor VL 148 2'59"
9 Canon in E major VL 149 1'10"
10 Prelude E minor VL 108 1'54"
11 Little March VL 168 0'32"
12 Mazurka in D minor VL 194 3'01"
13 Fughetta in B minor Op. 10 No. 6 VL 262 1'47"
14 Prelude in C major VL 229 1'09"
15 Prelude in A minor Op. 11 No. 1 VL 230 0'48"
16 Prelude in D major VL 305 1'12"
17 Ballade in F sharp minor VL 272a 4'11"
18 Fughetta on a Folk Song VL 284 1'30"
19 Prelude Op. 22 No. 1 VL 300 2'05"
20 Prelude in C major Op. 22 No. 2 VL 301 2'05"
21 Prelude Op. 22 No. 3 VL 302 0'45"
22 Prelude in A minor Op. 22 No. 4 VL 303 2'34"
23 Prelude Op. 22 No. 5 VL 304 1'14"
24 Prelude in D minor Op. 27 No. 1 VL 308 1'08"
25 Prelude in D minor Op. 27 No. 2 VL 309 2'36"
26 Prelude in D minor Op. 27 No. 3 VL 312 0'35"
27 Prelude in B minor Op. 27 No. 4 VL 313 3'36"
28 Fugue VL 337 4'28"
29 Prelude in C minor Op. 32 No. 3 VL 341 1'19"
30 Prelude A major Op. 32 No. 2 VL 335 2'29"
31 Music for Whitsunday VL 337a 1'38"
32 I've Sown Rue VL 334 2'29"